I took the #10 Ranger Manila Tag and applied Claudine Hellmuth's Studio Multi Medium Matte to the surface. I then took some dictionary paper (Thanks Kim aka Peanut) and adhered it to the front of the tag. 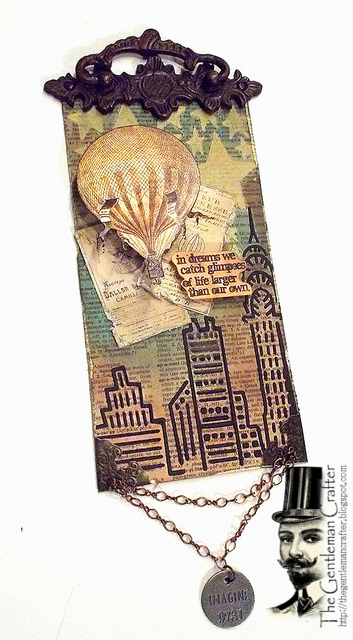 Next, I used the Crafter's Workshop, Urban Landscape stencil by Ronda Palazzari and some Wendy Vecchi black Embossing Paste to stencil the bottom of the tag. 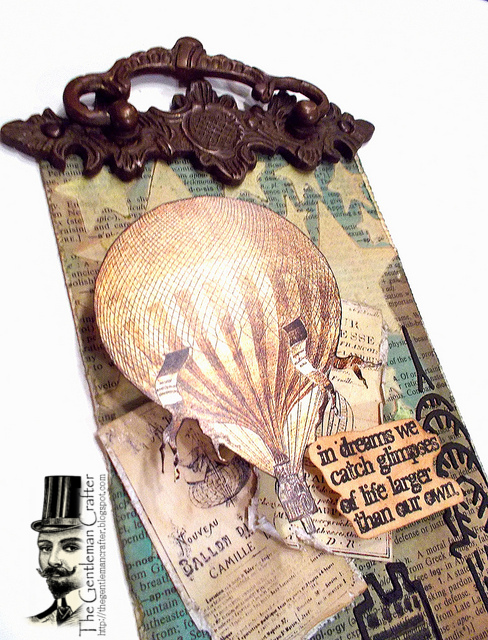 I looked in my box of ephemera and pulled out a hot air balloon and fussy cut around it. I then took two tickets and distressed the edges and adhered them to the tag. I coiled some wire around a marker and glued that on top of the tickets and then applied the hot air balloon to it. Next, I stamped a quote from Tim Holtz Stampers Anonymous Mini Ornates CMS 064 stamp set and cut around it. I distressed the edges with Vintage Photo Distress Ink and placed a dimensional foam piece to the back and placed that on the tag. I added the metal...My favorite part! LOL! 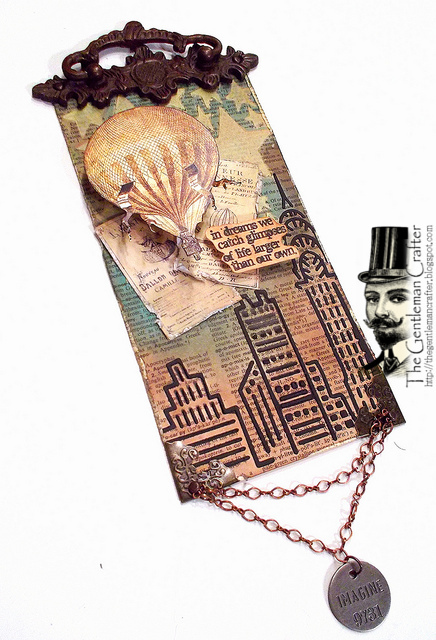 I added the Idea-ology Corner pieces to the bottom of the tag. I punched through the corner pieces with a We R Memory Keepers Crop-a-dile and added two lengths of Idea-ology Lace Chain to a brad and placed the brad through each of the holes. I placed an Idea-ology Jump Ring to an Idea-ology Philosophy Tag and added that to the center of the bottom chain. The Urban Landscape Stencil for this project can be found HERE. Thanks For Coming By Today! !...Happy Friday To You ALL!!! I think this tag is my favorite of all your tags! Maybe because the colors are a little more muted - not sure, but I love the feel, and atmosphere of this one - soaring high above New York in a hot air balloon, what a great thought! Great work as usual, Jim. This is just beautiful! I love it, the softness of the colors with the metal accents are stunning. I really want to make this one. Awesome as always!! Love that you combined so many different techniques and elements in a wonderful way! Have a great weekend! Let me know when you get low on dictionary paper. I still have another 900 or so sheets left over. You can not have "D" for Dachshund. Spectacular as usual. One of my faves! This is awesome! It was a pleasure meeting you at CHA. I love how you used my stencil. Seriously love! Isn't it the stamp in the center of the oval in the set shown Jim?? Fantastic tag by the way! TFS!! Bahahahaha! You are so right! It's in a different area on my set! Thanks for catching that! I will remove that from the post. You Rock! J. Wonderful tag. All of the layering really adds a lot of dimension. Love the cityscape. Thanks so much for sharing. What a great tag, love, love, love all the detail.I love how you attached the chain and the handle on top. I ordered the tags and embossing past from scrapadabadoo and can't wait to play with it. love this one! Hope you are doing better after your fall....better the mac went than you did! jus sayin! LOVE, LOVE this tag!!!! Each time I come to your blog I'm in amazement at your creativity and how your mind works!!! I wish I was in that balloon soaring over the city. You know I NEED that stencil...and you got the last one...LOL!!! This tag is just .... (lost for words) ...., love it! What a fabulous tag! I really really like this one! I have been thinking about getting that stencil this week, but now I'm going to need some embossing paste as well! Wonderful tag, every detail is perfect. Amazing, amazing tag. I just love it and especially the metal pieces. Awesome Tag! I love how you added all of the cool hardware to this one! You have a very creative mind! One day I think we need to chat, Michael and I would LOVE to pick your brain on a few things! I hope your weekend has been a blast! Have a fabulous week!!! just saw this and it may be my new favorite tag of all time, love it! The colors are fantastic and I will have to try my hand at something soon-been having a DRY spell of thoughts! Thanks for sharing your art and inspiration with us.